LLC “Senalg” was founded in 1994. Since 1995, the company carries out direct deliveries to the Ukrainian market of high-quality equipment. During this time our company has put on the market in Ukraine more than 20 thousand ultrasonic heat meters of brands «Sonocal», «Multical», «ULTRAHEAT». 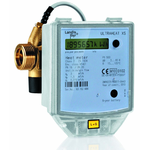 Since 2012 LLC “Senalg” is official partner of Landis+Gyr GmbH (Germany) on the Ukrainian market for the importation and sale of heat and flow meters ULTRAHEAT. Our company is authorized to carry out technical, information, service and marketing support of the above hardware and software. Here you can buy heat meters ULTRAHEAT T350/2WR6, T550/UH50, T230 flowmeters ULTRAHEAT T150/2WR7, communication modules, the data transmission system for heat metering devices. Also our company is a distributor of concern TA Hydronics which produces high-quality thermostatic valve Hiemeier, balancing valves Tour & Andersson, control valves TA CV, setting to maintain pressure and separators Pneumatex. The company annually participates in exhibitions in Ukraine and awarded with diplomas and awards. Our company is interested in cooperation with foreign companies, producing high quality mechanical heat meters, water meters, valves and data transmission systems. We hope that our business acquaintance will develop into long-term cooperation.